Introducing Mini Triton Clapton coil, one of the best replacement coils from Aspire. This coil expands the usage of the most popular atomizer of all time - the Aspire Nautilus. 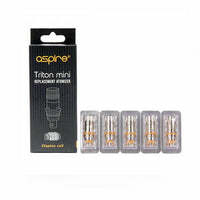 Specially designed for Aspire Triton Mini (not for the Aspire Triton or Triton v2), Aspire Nautilus and Nautilus Mini. It uses Japanese organic cotton for full flavor wicking satisfaction. Clapton coil resistances at 1.8 ohms (Rated for 13–16 watts). With a kanthal base wire and a kanthal wrap, these coils provide more surface area compared to standard coil designs. This results in greater vapor production which gives a noticeable increase in flavor. Ni200 wire at 0.15 ohm Ni200 temperature control coils. For a consistent vape every time. Kanthal wire at 1.2 ohm (Rated for 15-20 watts), Using traditional kanthal, this coil is suitable for a mouth to lung vaping or direct to lung vaping. Clapton wire at 1.8 ohms Clapton coils (Rated for 13–16 watts). Aspire Mini Triton Clapton Coil 5 Pack has a rating of 5.0 stars based on 1 reviews.